As with any other type of home remodeling or expansion project, there are a number of elements that all play a role in creating the final look and feel of your outdoor living space. But one aspect that is often underestimated is the use of color. As many people probably already realize, color can be an effective and powerful tool in establishing a particular mood or atmosphere. With outdoor spaces, there are some specific challenges to consider, but also some benefits. If the space will be uncovered and exposed to the elements, keep in mind that certain colors have a greater tendency to attract and/or reflect heat. You also may want to look into colors (and fabrics) that will be less likely to show signs of fading. On the other hand, you often have much more freedom when approaching the design of your outdoor spaces as compared to the interior of your home. You don’t necessarily need to feel obligated to follow the decorating or design scheme inside your house, so this is a great opportunity to be more creative. 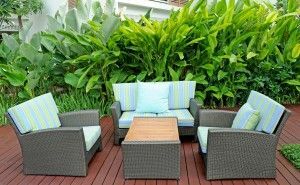 People often like to go in a more casual, bold or fun direction with the style for their outdoor areas. RW Remodeling has created many Arizona outdoor living spaces for our customers, and we would love to design a terrific new space for you.